Officials with the Boston Parks and Recreation Department recently announced that the prohibition on bike riding will remain in effect for Boston Common, Commonwealth Avenue Mall and the Public Garden because of the all the events held at the sites and because of the volume of foot traffic. Bicyclists are still able to travel on the properties — if they’re walking their bikes through, according to the City of Boston. This announcement comes after a number of discussions between property abutters, bicycling advocates, Walk Boston, the Friends of the Public Garden and various other groups. 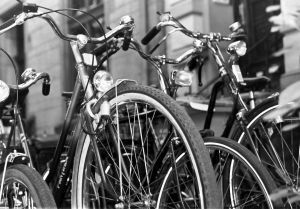 Our Boston bicycling accident lawyers understand that, although these meetings were very productive, there are still some disagreement that lingers regarding these areas and the nature of bicycling. The problem that officials see is that bicyclists come up quietly and swiftly behind pedestrians and are likely to catch them off guard. And that’s no good when you consider that these areas are some of the busiest for pedestrian traffic in the city. These properties host some of the city’s most popular events, which makes sharing this space tough. -There are signs that state where bicyclists are allowed to travel. These signs are located at these entrances. -If you’ve got a bicycle, you’re still welcome. You’re just asked to walk your bike through instead of riding. -Officials will continue the discussion on cycling in the area and will continue to push for safe routes for everyone. -Bicycling is allowed in City of Boston parks only on those paths that are designated for bike riding. But don’t think that bicyclists are getting shut out. There are still many bicycling events throughout the area. Coming up in the near future are the Hub on Wheels ride, September 22nd, and the TD Bank Mayor’s Cup Pro Race, September 21st. Since Mayor Menino launched Boston Bikes in 2007, ridership in the City has more than doubled. Many other important strides have been made in safety, education, and facilities. Both Commonwealth Avenue and Massachusetts were ranked as the most dangerous roads in the entire city. Close to 10 percent of the bicycling accidents in the city involved a pedestrian. About 35 percent reportedly involved a motor vehicle. Unfortunately, both men and women cyclists perceive cycling on off-road paths as significantly safer than biking on Boston streets. But we see here that that’s not oftentimes the truth. When you’re riding out there, make sure you’re riding in a safe and designated area. Some roads have marked bike lanes to the right side of the road. In ideal circumstances, cyclists should stay to the left side of the bike lane in order to avoid potential road debris and to stay outside the radius of the doors of parked cars.